I've spent the better part of the afternoon frustrating myself trying to get a decent shot of Ella for her 1st Birthday party invitations. It was IMPOSSIBLE to get her to sit on the backdrop. She literally ate an entire canister of Gerber fruit puffs that I tossed at her in between shots. Not to mention that fact that I was struggling to get my settings right on my camera. Aaagghh! I finally was able to capture exactly what I was after so I guess it was worth the hassle. How cute! You definately captured some wonderful shots! I see your camera finally got there ;) Looks great! I just love the pics...and the camera is amazing!!!! You will get the hang of the settings soon! She is adorable! Great pictures Hana! You are so talented. You have an adorable family! Great pictures and she is just adorable! Hi Hana! I have some exciting news for you over at my blog! 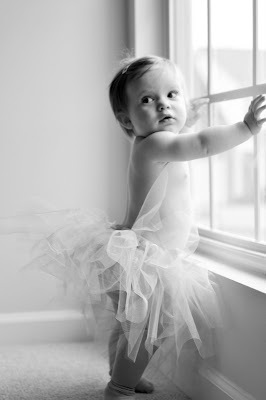 PS your little girl is adorable! Very cute. 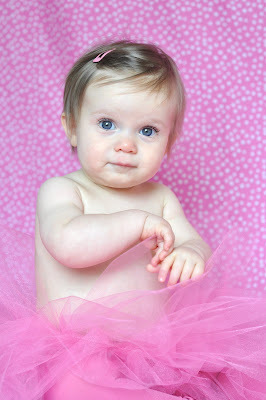 She looks adorable...and the tutu is such a fun choice for the photo. Oh, wow...look at that. You did really good. I love both pictures and shes one charming princess! !